April 16-22 is going to be one amazing week! Introducing (drum roll please)...STAND TALL WEEK presented by Long Tall Sally! It's a week long celebration of everything tall. Tall fashion, tall beauty and tall empowerment. What could be better? Stand Tall Week was created by Long Tall Sally to show every tall woman that their height is to be celebrated and embraced. The week is filled with everything tall including tall model scouting, a week long pop-up shop and fashion presentation and appearances by tall expert Arianne Cohen. Side note: I LOVE the logo with the heel in it. Rock those heels tall beauties! We all know how I love a Long Tall Sally pop-up shop and this one is open for an entire week! Unfortuantely my jet is in the shop right now (hehe:) or I would fly out and shop everyday! Click for store details and check out the TallSWAG video below to see what you can expect at an LTS pop-up. Meet tall expert Arianne Cohen. She is 6'3", a tall expert and is the author of The Tall Book (She's also from Portland, OR which also happens to be my hometown! PO! Woop Woop!). Click the pic for more on Ms. Cohen and her rold in STW. Long Tall Sally has amazing clothes. Instead of extending them and calling them 'tall' they actually create them for tall women. That's right ladies, they make cllothes JUST for us! Click to see what one of their garments looks like on in the TallSWAG review on their amazing shirt dress. 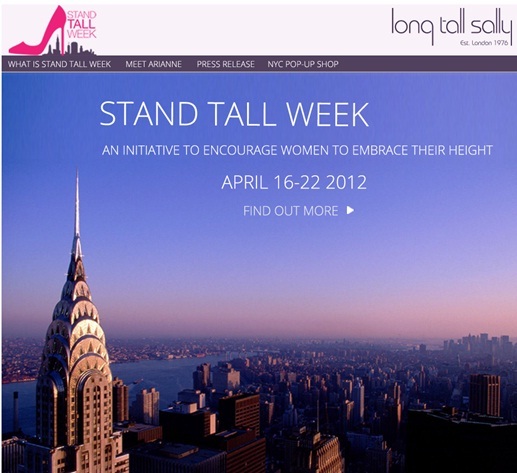 I know that the Long Tall Sally Stand Tall Week is going to change the lives of tall women. I encourage everyone to take part in some way, shape or form. We need more events like this to spread the message, to every tall girl and woman on this earth, that tall is beautiful! Let's keep this going. How are you going to spread the message?